This project is designed to engage children in the natural world, specifically the marine environment. We encourage a sense of stewardship and connectedness. BOP, within each project continues to inspire young people to collaborate and develop their own concepts, nurturing a deeper understanding of human impacts upon fragile ecosystems. Working together we produce art exhibits, culminating in a huge sense of pride amongst pupils. Nature Detectives – Nature Day at marine coastal reserve and beach clean. In School marine biology lessons given by experts in the field. Art Day – Production of exhibit and/or help with production of short film/animation. Certificates for pupils awarded at end of project. 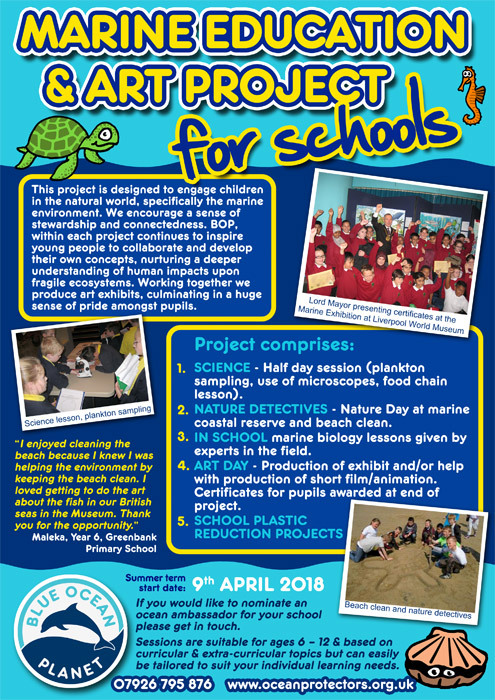 If you would like to nominate an ocean ambassador for your school please get in touch. Sessions are suitable for ages 6 – 12 & based on curricular & extra-curricular topics but can easily be tailored to suit your individual learning needs.